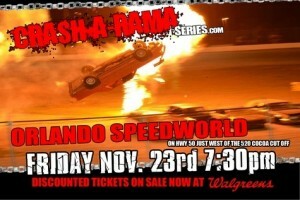 Orlando Speedworld is the home of the CRASH-A-RAMA Series which has become the biggest night of destruction in Florida. Always falling on the day after thanksgiving, the november shows have become a tradition every year for the fans and drivers. If you still have never been to a CRASH-A-RAMA Series event, the time is now! This is the last time in 2012 you will have the chance to enjoy the carnage and craziness that this show provides every year. The series has been featured on Only in America with Larry the Cable Guy, Tow Times Magazine and was recently given a full 6 page article in the October issue of the magazine Boating. Orlando Speedworld has brought this event to a level of its own. Year after year the series has something new and exciting for fans and drivers, and this year is no different. This time around the series is bring stunt stars Chris Morena & Tim Chitwood for some of the best professional stunts Orlando fans will ever see. Chris Morena and his Mostunts team have confirmed they will attempt the suicide spiral jump for the second time this year. Chris Morena shocked and stunned fans earlier this year when he completed a full suicide spiral jump that started with some amazing pyrotechnics and ended in a huge end over end nascar style crash. The series mite also have an extra surprise stunt in store, will see. Saturday May 12th 2012 is just another Saturday right? WRONG! May 12th 2012 will be remembered as Destruction Day in South Carolina, but do you know why? Because The CRASH-A-RAMA Series is back! Last year the CRASH-A-RAMA Series blew fans away with their wild, insane and intense races. Fans were treated to an out of control skicar race, a chaotic boat & camper trailer race, and a hard-hitting ground shaking demolition derby. Expect to see a lot more, because this year they are pulling out all the stops. Come out to Anderson Motor Speedway on Saturday, May 12th at 7:30pm for another night of thrills and destruction brought to you by the Knights of Destruction. This time around there will be new and exciting races and performances! This year we’re adding the Adam’s Auto Recycling “Appliance Race” and an armored tank race called “The Gauntlet”. We are also bringing in a first class stunt performance by world famous Tim Chitwood and Chris Morena. Tim Chitwood will be preforming 2 crazy stunts never done before at Anderson Motor Speedway, and Chris Morena will be preforming a “Suicide Spiral Jump”. Last year The Crash-A-Rama series made headlines since they were a part of the hit TV show “Only in America with Larry the Cable guy”. Since then the series has been on a rampage putting on great shows around the east coast from Florida to Indiana. This year the series has new races and events that will bring the series to the next level. Last year the series also put on a great show that broke attendance records at a number of tracks and this year is going to be even bigger. Expect to see an amazing school bus race, two demolition derbies, skicar racing, and the fan favorite boat & camper trailer race and so much more. All of this excitement will leave you at the edge of your seat wanting more and more! ©2019 MoStunts • Web Design by Graphic Bob, Inc.